In this May 16, 2017, file photo, a New Orleans city worker wearing body armor and a face covering attaches a strap to the monument of Confederate Gen. P.G.T. Beauregard before its removal in New Orleans, Louisiana. A time capsule found at the site where workers recently removed the pedestal that once carried a statue of Confederate Gen. P.G.T. Beauregard was opened Friday, revealing Confederate memorabilia and other historic artifacts. 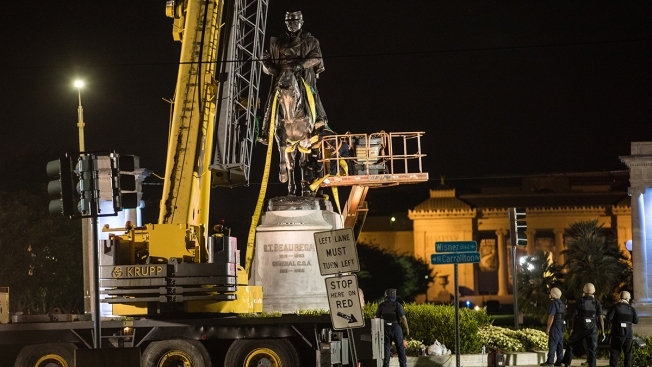 The statue was taken down in May — one of four Confederate monuments removed from New Orleans last year. The pedestal was taken down last week. The copper box's contents were shown to news agencies Friday, when Lt. Gov. Billy Nunguesser and historians pulled the items from the capsule. Confederate-era money, documents and flags, as well as a newspaper, were revealed, NBC-affiliate WDSU reported. A 1913 article in The Times-Picayune said the box also contained photos of Confederate leaders and monuments and "badges and souvenirs appertaining to the Confederacy." A photograph from the lieutenant governor's office showed a green and blue box holding browned folded paper or fabric, topped by a ticket for the time capsule's placement.